The purpose of this blog post is to shed some lite on all things sync related in Informant. This post is “kinda-technical” and if you don’t have a stomach for the nitty-gritty details then you might want to check out the next one. Table 1: Primary Features and which 3rd parties they can be synced to. This chart is an indication of what Informant can sync through various sync / online services. This isn’t a reflection of what each service is necessarily capable of – only what Informant can currently utilize. In virtually all situations, however, we make our best effort to support all fields and properties that a service offers. Calendar Properties refers to the calendar layer itself and not the individual appointments on the calendar. (See Event Properties for the actual Event/Appointment properties). This table shows that many properties including Tags, Icons, Image and Contact attachments are only available when using Informant Sync. If you use the Informant Google Calendar sync you can also get Event Colors and Attendees. This chart also shows that if you are using a Native Calendar, your attendees will be limited to read only access. Projects sync most completely with Informant Sync. Since Toodledo loosely supports the GTD methodology, they also support the concept of an Inbox. If you are using Apple Reminders, then Informant will show Reminder Lists as Informant Projects. This table shows many of the task properties and you can see the footnotes for additional details. Because each vendor implements tasks (or Reminders in Apple’s case) a little differently, it is probably the trickiest record that we deal with. (2) Toodledo supports basic contexts, but doesn’t sync location coordinates that Informant can assign to Context for location-based alarms. (3) Toodledo online doesn’t support free form locations like Informant does. However, Informant can sync locations through Toodledo to other instances of Informant by leveraging Toodledo’s sync metadata. (4) The free level of Toodledo only supports a few pre-defined alarm times. Toodledo requires you to get their Silver Subscription (or better) to have completely freeform alarms. Notes sync best with Informant Sync. Evernote is probably the next best choice. However, Evernote sync will not get the Icon property or the voice notes. It is noteable that Informant does NOT sync with Apple Notes. Apple has currently not opened up Notes to any third party developers (at the time this post was created). If Apple allows access to their notes in the future, we would be able to get to them. Do you have other questions about data record types and properties? Ask me in the comments section below. I wasn’t planning on continuing with a subscription to I5 because I don’t use any outside services like google or toodledo, but I did purchase I5 to own it outright and I plan(ned) to keep using it after my year is up. 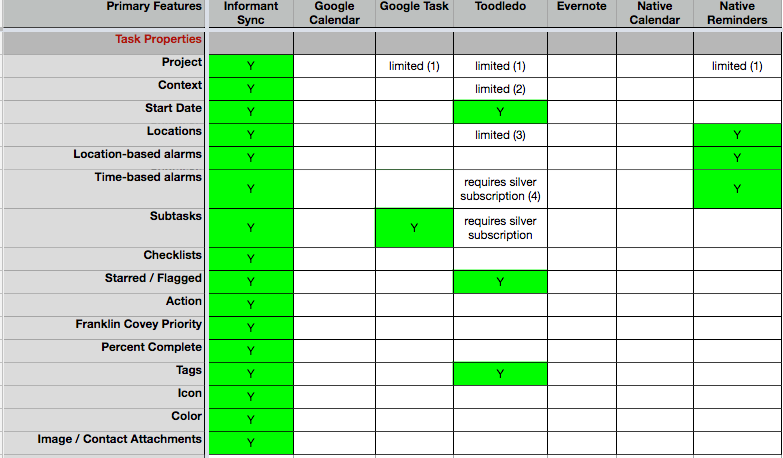 Looking at this first chart, however, it looks like Native Reminders for Tasks is considered a synced service. Does this mean that after my subscription is up I will no longer be able to tell Siri to remind me of something and have it translate to an Informant task? No. Accessing Native reminders IS NOT a synced service. If you are referring to Table 1, the way it should be interpreted is that: For the Primary Feature: Tasks, it can access its data from: Informant Sync, Google Task, Toodledo, or Native Reminders. Informant Sync, Google Task, Toodledo would be considered Sync Services. Accessing reminders via Native Data would NOT require a sync service. Isn’t there a way to make all these billing and syncing and owning differentials understood in a VERY EASY way. Each time I try to figure out all the details of running Informant on my MAC, iPhone, iPad Pro, I feel like I’m going to throw up. I have your Sync Service until November of 2018. If I want to buy into everything you are offering right now to cover all my devices for the next year, what is my grand total shown with the individual items that make this up? I’m getting a headache between no user guidance and all this charging. That doesn’t mean I don’t want it… What were we talking about again? Second, I totally agree with you… We are working on ways to make the subscription billing vs. one time billing vs. etc all easier to understand. If you have a subscription for Informant Sync that should cover you on the sync (of course) but also gives you Informant for iOS. If you purchase the Informant for macOS app, that is a 1x charge so no subscription required there. If you also have Android, that would be a 1x charge. So, beyond your initial purchases, you should only have one bill for $25/year for Informant Sync.